Did you read my Ancillary Justice review? No? Go back and read that, and Ancillary Justice. This is part 2 in a series and this review won't be mindful of spoilers from that novel. 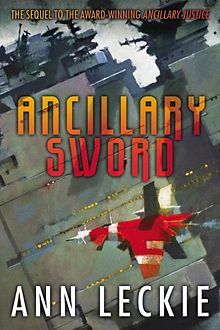 Scratch that, here's your spoiler-free review: Ancillary Sword has a smaller scope and loses some of what made Justice good with a slow, predictable plot. You'll be lost (but not hopelessly lost) without some of the context given by reading Ancillary Justice first. It's a 6/10, and probably 5/10 if you're not already invested. Still with me? Okay. Now that I've spoiled the score, let's talk about this novel. Breq is appointed the Mianaai family name, whether she likes it or not, given her own ship with a small crew, and sent to protect a remote space station from the Other Anaander. This key location is essentially a tea plantation, complete with alien slaves, and manipulative elites. While she's there, Breq tries to make good with the sister of Lieutenant Awn. Leckie continues to build on the world she created in Justice, and that stuff is largely good. We get a better look at how the common citizen lives, how aliens are treated in the Radch, and the extent to which the Radch has lost and is losing power in the galaxy. The twists and contortions made to determine who is taking orders from which Anaander Mianaai also keep the story on its toes. How do you determine which one is the "right" one? It's a problem Breq can't solve, because there is no clear answer. The fragmentation of the Radch is entertaining to read, particularly after spending most of Ancillary Justice reading about how monolithic and powerful it is. Unfortunately, Sword suffers from compression sickness. The planet hopping, timeline switching, constantly moving plot of Justice is gone and replaced with a much more linear story told on a much smaller scale. It all takes place on the space station and the planet below, with few excursions elsewhere. This dense plot is also fairly plodding and predictable. From beginning to end, it doesn't feel like the needle moved much, especially when compared to the previous novel. Further, if you thought Breq was on a high horse in Justice, the horse is now a giraffe on stilts. She's not just a stiff separated AI anymore, but now a stiff separated AI who's always right about everything. It wore on me, and surprisingly did not wear on the other characters in a realistic way. Though I couldn't put down Ancillary Sword, it didn't really impress me like Ancillary Justice did. There was a point in Ancillary Justice that really grabbed me, and I never got that feeling from Ancillary Sword. It squeezes everything I liked about Justice down in ways that don't really improve the novel. I'll certainly see the trilogy to its completion, but I'm going back into it less excited than I was after finishing Ancillary Justice. Ancillary Sword was a bit of a letdown.